I have known a lot of friends who used some of these softwares and amazingly they’ve done a great job. These days, everything is almost available online so if you just wanted to experiment and try out things for yourself, you may opt for free wares first! 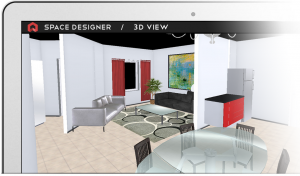 Space Designer is software you can use to plan out rooms and/or entire home layouts directly on their website. It’s super easy to use (drag and drop) and fun. Designs can be in 2 or 3D. While it’s free, they offer a donation option (no obligation). You can use this software directly on their website (nothing to download so it’s fast and convenient). HomeStyler is a free interior design software that’s easy to use. It’s web-based (meaning you can use it directly on the website without having to download anything). You design your room, doors and windows, experiment with inserting products in the room and then convert the design into 3D.